I’m in my first year of the diagnosis for celiac disease, I’m still absurdly sensitive to absolutely everything, I’m still making mistakes and I will probably be learning all my life. All celiacs know, gluten free diet is not enough to feel good, you have to make your beauty products, your home and even your friends (if possible) gluten free in order to stop feeling sick all the time. There’s so much more choices nowadays than it was, for example, 5 years ago, of gluten free products, both – food and skin care wise. Sadly beauty products are much more tricky. If you’re not latin speaking scientist, you’re in for a huge headache. After bleeding my eyes out with my daily researches, and after plenty of money wasted on wrong products, I have chosen what works for me. Almost all gluten free products out there are gluten containing just below the norm. Also, plenty companies state they remove the inflammation causing protein from the product, so it’s gluten free because of that. Well, for me, it’s still not good enough, because even though I might not get gluten sick, it still feels uncomfortable on me and reactions happen. So – do your research! No matter the many variations I tried out, I keep coming back to few companies or products, that never failed me, I never felt better and I absolutely recommend them. This post is listing my recommendations, along with other sources for you to choose what you might prefer. This is the first of my beloved and favorite companies, that I absolutely trust. I was raised with the idea that german quality is the best, and till this day – I’m continuously proven right. Logona was established in 1978, in Germany, celebrating 35 years anniversary this year. It was a group of enthusiastic people coming together, who knew the value of natural cosmetics and saw the huge gap in the industry, that had nothing like that to offer. Now they are one of the leading companies around the world, in natural cosmetics. Their cosmetics are not only purely natural, they are also cruelty free, vegan and almost 100% gluten free. When I’m saying almost – I mean there might be one or two products that are not, I haven’t come across them, but they are clearly stated as not gluten free. Their company has amazing environment and humanity related philosophy and values, that makes them so much more lovable. Unlike most products that are called gluten free, but just because of the “bellow norm.”situation, Logona is actually gluten free without even traces of gluten in any of them. That’s one of main reasons it’s perfect choice with no risk. I first fell in love with them for their website – it’s so easy, clear and informative. All products are nicely listed, with images, clear allergens and ingredients lists. After hurting my eyes every single day trying to figure out if this or that is safe for me, this was damn refreshing – just go in and in a sec. find out anything you need. I have been using Logona for the past few months and never felt better. Their products are absolutely amazing, smelling wonderful and long lasting. Their price is really nice too. As I said, I am absurdly sensitive, and all Logona’s products are great help keeping me comfortable. Feels lovely on the skin, smells uplifting, makes the face look smooth, kissed by sun and healthy glowing or healthy matte. Easy absorbing, no stickiness, adorable smell, refreshing, long lasting moisture. suitable even for most sensitive or damaged by psoriasis/egzema skin. Revitalizes and protects tired hair. Slows down hair loss. Leaves skin moisturized and clean. Few times a week, great to refreshen the skin. Perfect when traveling or when too lazy to wash yourself off. Creamy and moisturizing, perfect to hide bags under eyes, imperfections. Feels lovely on the skin. Stays all day even though it smoothes when putting on clothes so be careful, but otherwise, stays nicely without retouch. Read all about Logona on their website, watch on Youtube, follow on Twitter and Facebook. Find shop closest to you with the shop locator. In Denmark it’s available on Pure Shop. The second out of the two favorite companies, that I trust. Another perfect german quality – fantastic products and great price! Sante is all natural, organic products, that arecruelty free, vegan and almost all gluten free. As well as Logona, they are truly gluten free, without hidden agendas or traces. They have amazing philosophy regarding humanity, fair work policy, environment and all around their are very good guys, make sure to read all about that on their website! Huge applause for them, for recently retracting their products from China which is a huge market to be part of. They did that because of the cruel testing on animals that are still happening there and Sante does not want to be any part of support to that. Their website is also something to love and keep as example, with clear, big amount of information presented in very beautiful way. You can find anything you need to know quickly and same as Logona, they are fast and great in responding if you contact them. Great at revitalizing hands and comes in very “handy” travel size package. Stays on all day, feels and looks really natural. lovely smell. Doesn’t stop the water, but DOES stop the smell, you can feel safe about that. Suits most sensitive skin, also after shaving. Last very very long, just be careful not to drop it, will break like glass. Best conditioner out-there! Makes the hair super soft, shiny, simply easy breezy. Smells lovely too, and last enough even if you have long hair and use it a lot. Absolutely love this conditioner! I’m paring it up with Logona’s Shampoos and I rarely have a bad hair day. Most important – I don’t have to worry about gluten. Make sure to check out their website, Twitter (USA), Twitter, Facebook, Youtube, Instagram. Online shop. Shop locator. So far, I’m personally familiar only with Farfalla natural oils, but the company was very quick and generous in responding about their gluten free products, with enormous list! It looks like all their products are gluten free, but I’m not sure, because I didn’t recheck the list with all their assortment. But one thing is for sure – their Tocopherol is gluten free, and this one ingredients is usually the suspicious hidden gluten source, off course not in this case. The company originated in Switzerland, around 30 years ago and they are all natural products, they take good care of the environment and are very people friendly, handling their business and their workers fair. They are also transparent company, that has all the information online and always response to questions. My favorite products from them so far are – Avocado oil, WildRose oil, Argan Oil, Peach oil, Almond oil. All natural, gluten free, in very convenient to use glass bottles. Looking forward trying out more of their products. Here’s full list of their gluten free products. Other companies that found space in my collection of skin care and are worth mentioning. Another german company, founded by Thomas Haase. It’s all natural, environment, animal and all around friendly company, providing great products for great price. My issue with this company is confusing information. Quite many places on the internet, both – the company and the users – claim ALL their products are gluten free, even those with wheat germ oil. Then again, I received an email from them, that only some of their products are gluten free, not all. The more I researched the more confusing information I collected. In the end I came to the conclusion that all Lavera products in USA are gluten free, in all other countries you have to check the ingredients very carefully. They did write though that all their Sun Care products are gluten free and that’s exactly what I bought plenty off, without reading enough before purchase. I’m glad I did not went more wild in the shop. One product that I can’t imagine my life without anymore is their self tanner! I’m still very much unclear if it’s gluten free or not. However, I have used it quite many times now, haven’t had any bad reaction and I HOPE I won’t, when using it longer! After being forced to be pale, because of all the skin problems due to celiac disease and sudden sensitivity to sun, I was avoiding mirrors often, and was scared of this summer season when you can’t hide underneath clothes anymore. Luckily I don’t have to! I look naturally tanned, the tan lasts for a while and it’s more than enough to refresh it once in a week or two. It’s the longest and most natural tan I have found till now and I have been experimenting with self tanners for many many years. It also softens and nourishes the skin. I also love their Lavera Basis Sensitive : Organic Hand Cream. Perfect for every day hand nourishment. Easily absorbed. So I do recommend at least these two products from Lavera and am crossing my fingers that it really is safe to use as it seems to be so far…. All natural, organic, against animal testing, environmental friendly company, with long years of experience and huge range of products to choose from. It’s really great company and quick at responding to questions. I never was contacting any companies ever in my life, now I have to, so there’s ne criteria in my value list and that’s companies client services. With so many companies not bothering to answer at all (yes it happens), I do appreciate all those that do and do it properly. According to Dr. Organics team, so far the only products that MAY contain gluten are Moroccan Argan Oil Bath and Massage Body Oil. Argan oil Bath gel did give me small reaction after using it for few times so I stopped. They also claim, they do not guarantee there are no traces of gluten in any other of their products, since they use the same facilities where gluten is handled. I do use their Antibacterial Toothpaste for around 4 months now and luckily I do not have any bad reaction. I love that toothpaste and I hope I won’t have to replace it. It does leave your mouth fresh, teeth white and it’s all around my favorite, all natural, organic toothpaste. It’s also free of milk. I have also read online, that quite many celiacs are really happy with Dr. Organic toothpastes and mouth wash, it even helped with mouth ulcers that occur often to celiacs. It did help me with that. I also used their Organic Moroccan Argan Oil Restorative Treatment Conditioner. No side effects and nourished hair. Just don’t use too much, the hair gets too heavy when dry. I do however plan to expand my use of their products, there’s too many and they look too delicious to pass, hopefully the experience will be with no side effects. Now this is the company that I fell in love but was heartbroken when I found out I can’t really experience it as much as I’d like to. I love their philosophy, their story, their visual presentation – everything about them! However, their certified gluten free list is really short. They are not yet filling that department, but I truly hope they will in the future, because I would love to fill up my home with their little blue bottles. I did purchase their Almond moisturizer cream and Mineral Powder, which seemed safe. It arrived in lovely, all environment friendly package really quickly and with a beautiful thank you note. That what the company is about – style and kindness all the way. But I did get bad reaction from their cream and their make up, even though I was in denial for some time. The company though, is truly worth to check out, it has very informative website, with absolutely all ingredients listed, and wide range of pure oils, that don’t have any dangerous ingredients. Their new Mascara has been listed as one of “must haves”in many magazines these year and it’s gluten free. Again – german quality to remember. Pioneering holistic pharmaceutical company WALA Heilmittel was founded over seventy years ago to help to advance chemist Dr. Rudolf Hauschka’s mission “to support the healing of humanity and the earth.” n 1967, WALA introduced Dr. Hauschka Skin Care. They are also environment, humanity and animal friendly company, with great range of products, stylish packaging and a list of gluten free products clearly stated on their site. They are one of those truly transparent companies with great costumer service. Even though they are calling themselves gluten free with the small amounts of gluten in their products, many of their GF products do not contain any dangerous ingredient in general. I am really happy with their Liquid Concealer. It’s light on the skin, so it’s for those “better days”when you don’t have to hide much. Lovely smell, long lasting, very convenient packaging. And I loved their Rose Body Moisturiser, refreshing, calming skin, lovely smell and easily absorbed. Looking forward trying out more of their products, specially since they are available in my country luckily. Before I went truly organic, I was loyal body shop member. Even though I am not happy they still use parabens in their cosmetics, I do still like the company for all that it is and all their values. Most of all I love them for their smell! Therefore I was super excited to find out their gluten free products list is endless. My home is still filled with quite many body shop products from older days and apparently they are all gluten free. 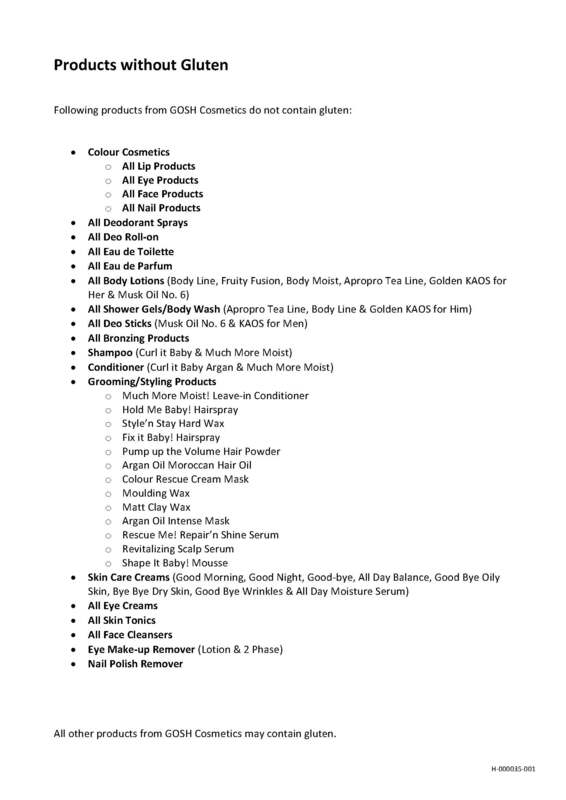 Here are few responses (1; 2) by the Body Shop people, that have been very helpful in so many cases, so if you just browse the internet or local store, there’s plenty of information. I have written about this company before. I don’t use their skin products anymore, but their make up Mineral Powder is irreplaceable for me. I keep coming back to it after trying out others. I was very happy to discover, all their products are gluten free. This company was founded in Denmark in 1945, first as pharmaceutical company then as cosmetics company. It is not all natural and organic, but they are paraben free and animal cruelty free. I include this company in my list, because after I discovered I have small products of their like eyeliner in my home, I did a research on them. They were also very quick and friendly in responding about their products and provided full list of their gluten free products. I used their self tanner, besides it being gluten free and feeling good on the skin, the other big advantages were – no ugly smell, really natural tan. However, the tan was a bit too natural, which means barely seen. You can make it stronger fir example applying every day for a week, but even when you reach nice results it won’t last. After coming across the previously mentioned Lavera self tanner, Gosh lost big time. Their gluten free list is quite long though and it is good quality company, so maybe there will be something for you. Garnier was my Go-To company since high school days. Off course, I’m not much on using their products for many years now, but I do use their hair coloring products, it’s the one product that no matter which one you choose, the hair are shiny and healthy after the coloring, no side effects and the color lasts. I believe it’s a well known company that needs no introduction. What you might not have know, is that All Garneir Fructis hair color lines have no gluten added. This includes the Nutisse, Nutrisse Ultra-Color, Herbashine and Nutrisse Nourishing Color foam. I did not have problems yet with using their hair color. Regarding other products of theirs, they provide long list of ingredients with gluten and they always state the ingredients clearly on all packages. One last company to mention. Even though I did not manage to find out about their gluten policy, I do know that the creator of DKNY perfume Donna Karan, is a very healthy living woman, that enjoys gluten free food. I am big fan of her Be Delicious Line. I did not spot myself any ingredients that seemed to contain gluten and I have been using Be Delicious Apple and Fresh Blossom, with no side effects so far. I’m obsessed with the Fresh Blossom smell, very light and sweet, perfect for every day.